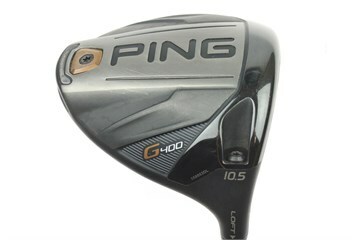 The new G400 drivers' streamlined shape advances aerodynamics and stability to Ping's highest levels ever. The multi-material design combines reduced drag, a forged face to increase speed and distance, and a tungsten back weight for producing Ping's fastest, most forgiving driver ever. Faster Forged Face: A thinner, hotter impact area that is precision machined to elevate ball speed across the entire face results in 16% more flexing and ball speeds nearly 2mph faster. Tungsten Back Weight:A higher-density back weight helps with forgiveness and allows you to customize your swing weight. Adjustable Launch: You can fine-tune your launch conditions prior to a round by adjusting loft up to +/-1°. Satisfying Sound: Extensive research and computer simulation coupled with music theory allowed the engineers to design internal architecture that fine-tuned the frequencies to produce a deeper, more muted sound. Dragonfly Technology: Dragonfly Technology creates an ultra-thin crown and skirt for weight savings to optimize the CG location and increase MOI for maximum forgiveness and accuracy. As most people have stated the quality of product is exactly as it states on the Golfbidder website, if not better. I just need a couple of lessons to increase my accuracy and distance, which I am sure this club can give me. I will definitely use Golfbidder again and have already recommended the website to a couple friends. Upgraded from G30SF Reg shaft which I found very whippy, the G400 I carry a good 20 to 30 yrd further with much more penetrating flight and tighter dispersion. Great club and great service from Golfbidder.